AVID (Advancement Via Individual Determination) students at B-L Middle School are changing the landscape of their school and learning new skills through an innovative community service initiative that began back in September. 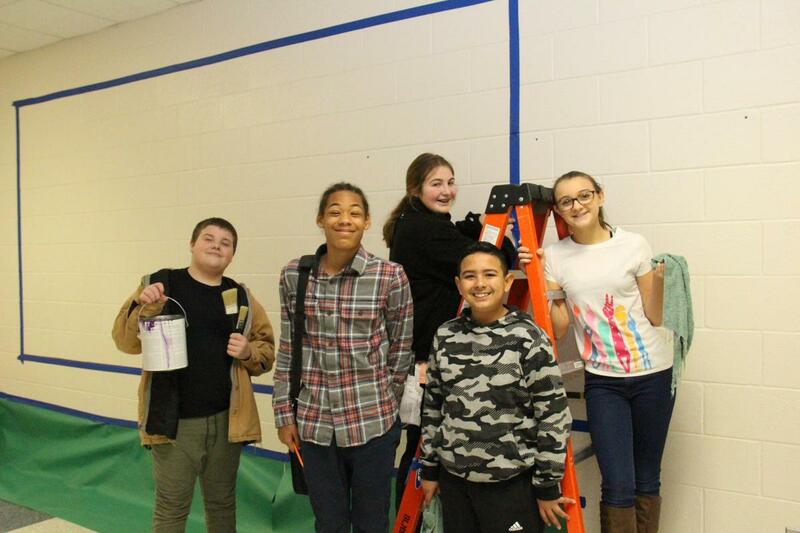 On the second and fourth Fridays of every month, AVID students who have at least a “C” average in all of their classes are able to participate in service projects around the school. The projects, which range from small tasks such as making copies and laminating items for teachers to large projects like creating bulletin boards and painting murals, are based on the needs and suggestions of school faculty and administrators. utilizing a rigorous college preparatory curriculum based upon eight domains that focus on writing, inquiry, collaboration, organization, and reading to support their academic growth. The AVID elective course also gives students the opportunity to participate in tutor-facilitated study groups, motivational activities, goal centered learning, and collaborative lessons. AVID allows for students to take charge of their learning and teaches them how to be responsible when looking towards their academic future. Community service projects like the ones listed above assist with these overarching goals by building students’ resumés and expanding their knowledge of various skill sets. School officials hope to eventually grow the bi-monthly AVID community service projects to outside of the school so that more Batesburg-Leesville residents can benefit from them.